I’ve recently been looking for a new Chromebook. My Nexus 7 tablet just doesn’t cut it for a lot of things, and I’d like to not have to boot my desktop for some of these (relatively simply) tasks. I’m aware there are some new Chromebooks being released that are fanless and more powerful and have better battery life than previous versions (such as i3 and Tegra processors) so I started looking online. 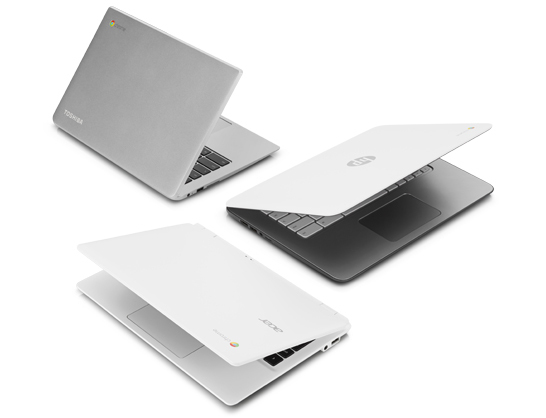 I was surprised (and disappointed) that there aren’t any good places that compare hardware in all of the Chromebooks, despite the hardware being the only thing that’s really different with Chromebooks! I’m a bit picky, and definitely want my Chromebook to have a higher-than-1366-768 screen resolution and at least 4GB RAM and it was hard to just find a list of the devices that met these requirements. I started compiling a table of all the Chromebooks I could find, and kinda got carried away. I thought it was worth posting it online so that others can sort/filter/compare Chromebook models more easily! If you find any mistakes or anything missing; please let me know! You can contact me in various ways from the buttons across the top of this blog.